We ran the Run Like the Wind race in San Ramon. It was the third annual for this event. 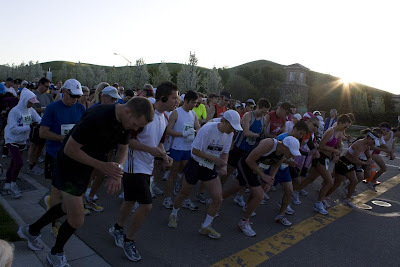 The race starts and finishes at the Dougherty Station Community Center at 17011 Bollinger Canyon Rd, San Ramon. They had a 5k and a Half-Marathon. The race was well orgaized this year. This is probably the best Half-Marathon option for you if you live in the east bay, and your not looking to drive that far.